Issue # 8 cover REPEAT PERFORMANCE! Ratchet finds and revives the Dinobots, but what happens when Megatron violates thier agreement? Also, Josie Beller turns herself into Circuit Breaker. G. B. Blackrock unveils a cannon that can destroy TF’s. When D’s attack, Circuit Breaker attacks A’s and D’s alike. Artwork by future Darkhawk and Shazaam artist Mike Manley. 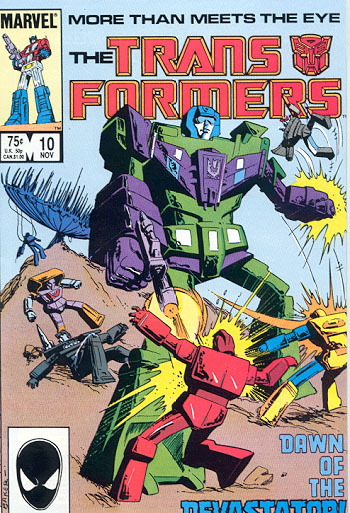 Shockwave creates the Constructicons and Optimus Prime is forced to give them life with the creation matrix. Shockwave discovers that Optimus no longer possesses the creation matrix when he does not infuse life into Jetfire. Jetfire is programmed to retrieve Buster Witwicky, but Buster uses the creation matrix inside him to disassemble him and put him under A’s control. 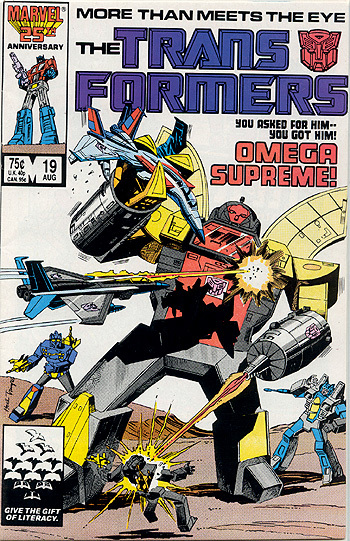 Issue #12 cover PRIME TIME! 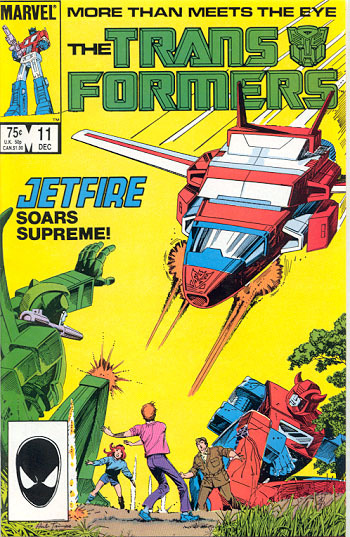 Buster Witwicky pretends to be Jetfire’s captive in order to infiltrate Shockwave’s headquarters. Shocwave dumps a false Optimus Prime head into a swamp, where the A’s rescue it and join it to Optimus’ body. Optimus, under control of the false head, attacks the A’s. 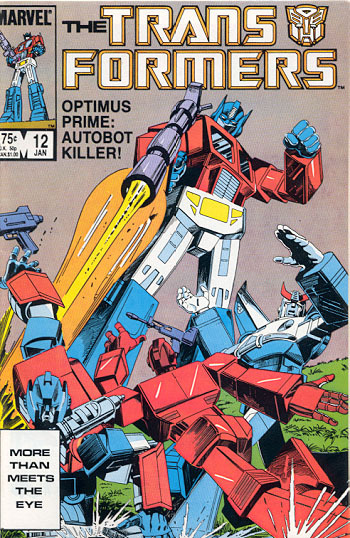 Buster returns the creation matrix to the real Optimus Prime. 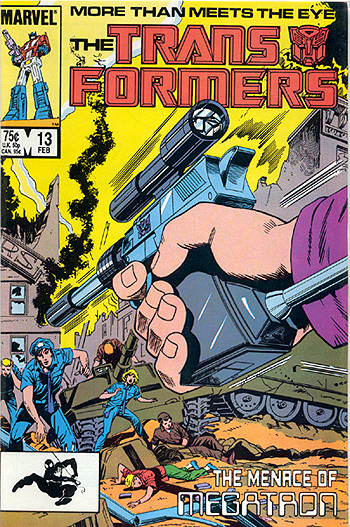 Megatron returns when Joey Slick, who uses him to rob banks, etc, discovers him. Issue #14cover ROCK AND ROLL OUT! “May your luster never dull, and your wires never cross!” is an old Cybertronic proverb quoted by Optimus Prime as he brands Jetfire an Autobot. Five A’s that were copied onto the Ark 4 million years ago are reborn as Grapple, Hoist, Smokescreen, Skids, and Tracks. 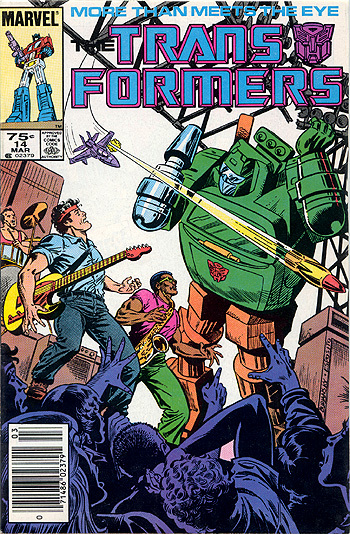 Bumblebee and the new A’s fight D’s at a “Brick Springhorn” concert. In an attempt to prevent public panic over the TF’s, The Intelligence and Information Institute (I.I.I.) 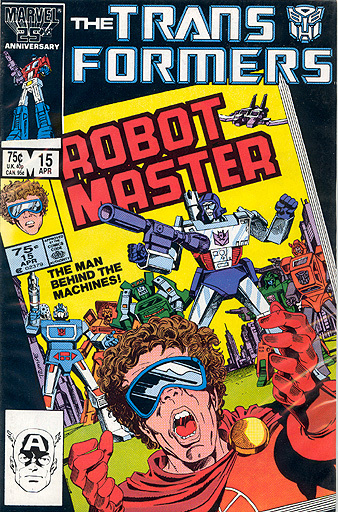 concocts a ruse that a human calling himself the Robot Master is controlling these robots for reasons unknown. 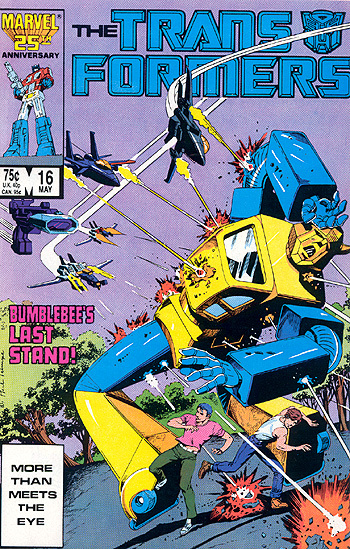 Bumblebee runs away because he thinks he just gets in the way. The D’s want to override his programming and use him as a spy inside A’s headquarters. 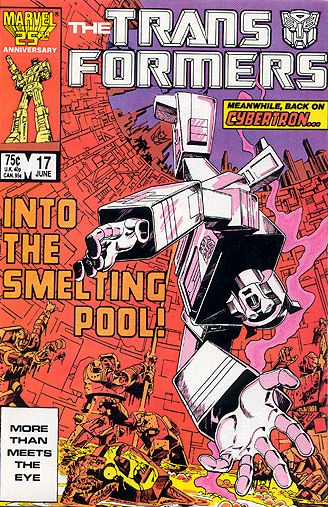 Issue #17cover RETURN TO CYBERTRON PART 1: THE SMELTING POOL! 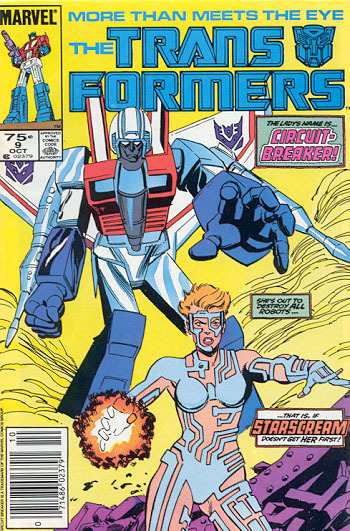 One of the best comic storylines of the pre-Simon Furman era. 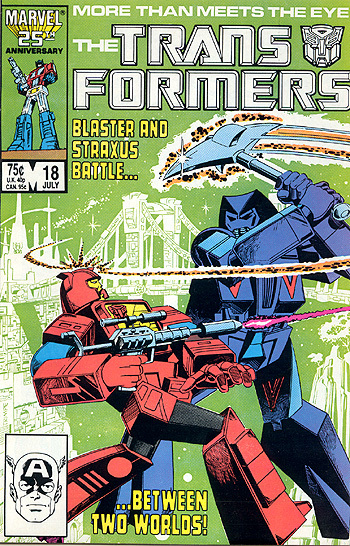 The province of Polyhex is held by Straxus and his D army (Insecticons, Dirge, Ramjet and Thrust). Inside Autobase, Perceptor commands Blaster, Beachcomber, Cosmos, Powerglide, Seaspray and Warpath. Blaster attempts to rescue his good friend Scrounge from the smelting pool, but Scrounge gives him a data disk and Blaster can only watch as the pool engulfs his friend. The disk contained information that Optimus Prime and the others were alive on Earth. 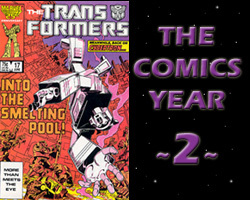 Issue #18cover RETURN TO CYBERTRON PART 2: THE BRIDGE TO NOWHERE! Straxus attempts to finish interdimensional spacebridge to Earth, but A’s attack his fortress, Darkmount. Cool alt. mode Straxus. Blaster finds Spanner, the scientist forced to build the spacebridge and he is the spacebridge. Cool robot mode Spanner. A’s and D’s fight on the spacebridge and some are trapped on Earth. A’s attack D base to learn of Devastator’s combiner technology. 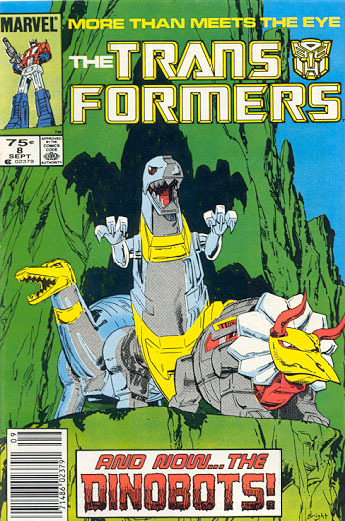 Megatron attacks “vacant” A headquarters, but finds Omega Supreme instead.